Precious Moments in Eternity with God! 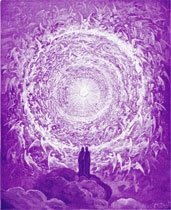 I had studied Beloved Saint Germain's Instruction on the Mighty I AM Presence, the Violet Flame, and the Ascension since August of 1968. I read and re-read Dictations from Ascended Masters and Cosmic Beings, and attended "Fundmentals Lessons" in 1972 at The I AM Temple in Chicago. I read and re-read Unveiled Mysteries, The Magic Presence, and The "I AM" Discourses. I joyously accepted the Truth of the Ascended Master Teachings, and rejoiced at the Wonder and Beauty of God, the Mighty I AM Presence, and the Fiery Pure Christ Mind of each individual! However, during that time I had also meticulously looked up and read every article ever written about the "I AM" Activity in the Chicago Public Library, and they had all been negative (except for one). In 1972 I obtained an old used copy of a so-called 1940 "expose" book about the "I AM" Activity back in 1972, and read it cover to cover, I had become concerned. That pesky doubt and human questioning that we have all encountered some time in our lives reared to the fore of my consciousness. I had often read the quote from Sacred Scripture that’s been thrown around: “Prove Me now herewith, saith the LORD of Hosts” - so I decided that if there’s anything to that quote, I’ll try it and find out the Truth! I decided that this was it. Either God proves to me that the Ascended Masters are real, or else if what I request as proof does not happen, I would no longer be wasting any more of my time on that nonsense! But the dilemma I had was - what could I ask as a “super-natural action” by God that would give me absolute proof? Soon after pondering this, I turned on the TV set and “just happened” to see Kathryn Kuhlman being interviewed on Chicago’s Howard Miller late night talk show. I had already read about Kathryn Kuhlman, and how she was a simple Christian lady who held huge “miracle services”. Thousands of healings were claimed to be documented across the United States (she passed away in the late 1970’s). Unlike other “faith healers” who considered themselves to have a healing ministry, she did not consider herself to be a "healer". She always insisted that God is the only Healer! For decades she would hold services in which the audience and she would sing praise to God, Jesus Christ, and the Holy Spirit. At some point in every service - suddenly she would stop in the middle of her simple sermons, pointing out an individual in a certain seat was being healed of a particular illness that she would name and describe, and then point out another, and another. She would go faster and faster as this “chain reaction” of “healing” continued. In that late night Chicago talk show interview on October 4, 1972, Kathryn Kuhlman stated that there had been thousands at the “miracle service” earlier that night. She said that there were still thousands more turned away after even the overflow auditoriums had been filled, with hundreds of incredible healings. Since the deadline for a psychology term paper in college was fast approaching, and I still had not decided on a topic, I decided then and there that this would at least make for an interesting subject! I was going to write a paper exploring the various types of weak, naive and susceptible personalities that fall for such “faith healing bunk”! So the next night, October 5(th) I went to Chicago’s McCormick Place along with my parents. I was astounded by what I saw. Ambulances were lined up outside the huge auditorium. Rows of wheelchairs and stretchers were lined up between the stage and the first rows. People were being asked to come up on stage and tell the rest of the people what had just happened to them while they were merely sitting in their seats. The lines of people, numbering in the hundreds, exteded through the Arie Crown auditoriumThey would each come up and go through a little question and answer routine with Kathryn - claiming to have been healed while just sitting in the audience (as well as people brought in on stretchers by ambulances from Chicago hospitals). She would then say something like “Dear Jesus, I thank you for this healing!” As she would say this, she would reach out to touch the person on their head or forehead, and the person would fall backwards (often before her hands even got close to them). This would happen repeatedly - as dozens and dozens of people went up on stage and told of the experience they had just had as they were sitting in the audience. Since I had just gone through lots of “inner struggles” as to whether anything religious in nature was real at all (especially since I was disappointed that I had possibly been deceived after just having read an "expose" book about the Teachings), I decided that this was the place and the time to place myself intensely but humbly before God — the Almighty I AM Presence — and ask for proof to be presented to me once and for all about the Ascended Masters. I intensely desired to know the Truth and not be misled by anyone regarding my Spiritual Path. So I decided to make a quiet (but intense) call to God, the Almighty I AM Presence, to prove if the Ascended Masters and the Teaching were real by having a specific thing occur to me in full view of thousands of witnesses. If nothing happened, then I would conclude that the Ascended Masters were not real - just a clever con game by the Ballards. By that time I had climbed up on the stage and pushed my way through the hundreds of people that were around and on that stage. I tried to think of something specific that I could ask for that could not be mistaken as a coincidence. As I was thinking, she concluded her service and was walking off stage. I quickly tried to think of something “impossible” to ask for. I told God that if she comes back on stage and goes straight towards me (I had by that time pushed my way into the center of the crowded stage) and reaches out and touches me - and no one else - and then walks off - and if I feel tangible “Power” passing into me, then I would conclude that the Ascended Masters are real. As she reached the end of the stage, suddenly, I saw her stop and turn around, and with her bodyguards pushing people away to clear the path for her, she walked at a brisk pace straight toward me! She put her hands on my shoulders and moved me into an open space. I watched her hands reaching toward my forehead - and I was still a skeptic - expecting nothing would happen. The next moments I experienced what I can only describe as a powerfully intense electrical “tingling” sweeping down through my body — as if a lightning bolt struck me!. I lost all sense of physical balance and sense of direction, and my body fell backward down onto the floor. For what seemed to be “hours”, I experienced the most beautiful and profound experiences “out of my body”. I won’t bother describing all that I experienced during that time, since those inner experiences could be easily (and for good reason) be discounted as “subjective”. But the objective fact was that she did EXACTLY what I had asked God to use as “a sign”, and it was witnessed by everyone in that 6,000 person auditorium. "Hours" in the Higher Octaves of Light! From a Joyous Oneness with the UNIVERSAL ALLNESS OF GOD — I was the Wondrous All-Pervading Presence of Life, Love, and Light — The One — the GREAT "I AM"
From the level of my Beloved Individualized God Flame — the Divine Identity of my Highest, Purest Being which proclaimed "I AM" from the Universal Consciousness — in "the Beginning" — and became an Individual Self Conscious Identity with a Divine Nature — I looked out upon the Limitless Light and all the created worlds and galaxies - visible and invisible! From the level of my Electronic Body — I looked upon the Beautiful and Glorious Sights of the Ascended Master Octave - including the Shining Electronic Bodies of the thousands in the Arie Crown Auditorium in Chicago! I entered the Central Sun and a Great Hall of Learning (like a library but there were no books - only Collections of Crystal Discs which projected holographic images when activated. I was made aware that I could have the answer to any question I might have about the Perfection of the Presence and the Mysteries of the Universe — and I Joyously proceeded to learn the answer to many questions about the Universe that I had always wondered about! From the level of my Causal Body — I journeyed through the Bright Realms of Akasha, thrilled with Colors and Tones of Wonrous Beauty everywhere. From the level of my Holy Christ Presence (my Higher Mental Body) — I experienced the the Oneness of the Cosmic Christ Consciousness of the Buddhic Octave, and looked out upon the audience and saw their Heart Flames, and was also astonished to simultaneously see myself looking out from their Heart Flames upon the stage where my outer form was lying on the floor. I experienced Illumination and Faith flooding into my mental body, assuring me of the Goodness and Reality of the Presence of God! I experienced Love and Purity flooding into my emotional body, assuring me of God's Love for me and the Purity of the Divine Nature of my Being! I also expereinced looking down upon my flesh body lying on the floor as I was consciously in the etheric double of my physical body. 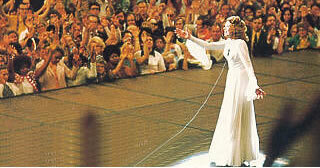 My parents, who had watched this unusual event from the second balcony level, later told me that I had been lying on the floor for only half a minute before being helped up by the ushers, and that Kathryn Kuhlman had immediately left after that encounter with me and walked quickly off stage - not looking at anyone else nor stopping to touch anyone else! After this, I was for a number of days really convinced of the Reality of the Ascended Masters, wouldn’t you? I kept thinking about my experiences during those incredible 30 seconds (that seemed like hours) “out of my body” and with God. I felt the effects for days: joy, a feeling that I was almost “weightless”, and on and on. After about a week, I started to have real doubts about the whole experience. Was it some weird coincidence? Was there some type of premonition of what would happen (as someone suggested to me), and I simply thought that I had come up with the idea of what to ask for as a “sign from God”? I also started to realize that I did not have an answer as to whether it was just the Ballards’ version of the Ascended Masters that “God had proven” to me was true, or whether the version presented by Mark and Elizabeth Prophet in The Summit Lighthouse was also true. So I decided that the next time Kathryn Kuhlman came to Chicago, I would do an experiment. I would again call to God for the exact same experience to happen to me again as a way to once and for all time clarity if the Ballards were the ONLY Messengers forever! Kathryn came to Chicago in April 1973, and I again asked for this miracle to occur to me in full view of thousands of witnesses. I actually did NOT really expect anything to happen this time. I prayerfully and humbly, but with great intensity, declared to God Almighty that if this miracle occurred again - exactly as it had back in October 1972, I would consider this to be proof of the Messengership of Mark and Elizabeth Prophet. If it did not occur, then I would conclude that they were merely clever imitators of the Ballards, and that I should remain faithful only to the Ascended Master Teachings presented by Guy and Edna Ballard in the "I AM" Activity. As that April 1973 service was concluding, I again worked my way onto that stage with great determination. What I asked for as a sign from God happened AGAIN exactly as I had asked - just as she was walking off stage, she stopped, turned around, and walked straight toward me - singling me out from the hundreds of other people on that stage. I went through the same inner experiences as she again touched me and I felt that “Power of the Holy Spirit” (Divine Light, Life, and Love) surging through my body. I considered this to be my “proof from God” as to the authenticity of the Teachings of the Ascended Masters - as presented through Guy and Edna Ballard, and as presented through Mark and Elizabeth Prophet. My quest for Truth and Happiness had been long and steady but I had found both — and no human being can take them from me, because they are Eternal and come from the Presence of God. In response to the Heart Calls of many students, and in response to Beloved Ascended Master Saint Germain and Beloved Ascended Master Morya El, the Karmic Board and the Cosmic Councils approved the Dispensation for a new Ascended Master Activity to be named The Temple of The Presence. Since May of 1995, the Ascended Masters have Accredited and Anointed Monroe Julius Shearer and Carolyn Louise Shearer as Their Messengers serving in the Office of Anointed Representative® of the Brotherhood of Light to the outside world. As with their predecessors in this Spiritual Office, Monroe and Carolyn have been preparing for this mission for several embodiments. Many students of the Ascended Masters have recognized by the Spiritual Discernment of their own Heart Flames that the Ascended Master Hierarchy of our Earth has authorized ongoing current Dictations by the Ascended Masters, Elohim, Archangels, and Cosmic Beings through The Temple of The Presence. Back in June 1974 after 21 months of miracles, I had asked the Almighty Presence of the "I AM" for a spectacular sky show to be presented by the Ascended and Angelic Host to all who attended a Quarterly Conclave in Spokane, Washington in July 1974. At the conclusion of that event, Archangel Michael announced a "Dispensation of Faith" to all that were present. Immediately after that announcement, all then experienced this glorious event, which was written about even by newspapers such as the Chicago Tribune. (4) I had promised God in July of 1974 to no longer ask for outer signs for Divine Direction or to confirm my Faith. Therefore when I first learned of The Temple of The Presence at the end of August of 1998, I went Within through my Heart Flame to my Beloved Mighty I AM Presence and Christ Mind (Higher Mental Body) to confirm whether this was truly an organization which the TRUE and LIVING Ascended Masters had established, and in which They were releasing AUTHENTIC DICTATIONS and ASCENDED MASTER RADIATION to the students. (5) The Answer I received was a resounding YES! The Brotherhood of Light is a Spiritual Order of Hierarchy and an organization of Ascended Masters united for the highest Service to God in all life. 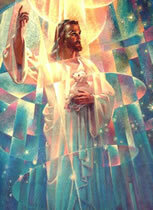 This Brotherhood and Sisterhood also includes Jesus the Christ, Gautama Buddha, Mother Teresa, and many Ascended Teachers of mankind, Members of the Heavenly Host such as Archangel Michael, the Spiritual Hierarchy directly concerned with the Spiritual Progress of our world, as well as certain unascended chelas. The word "white" refers not to race, but to the aura (halo) of the White Light of the Christ that surrounds the saints and sages of all ages who have Arisen from every nation to be counted among the Immortals.